In this video lesson I’ll teach you how you can use subdivisions on bass to achieve amazing timing on any bass groove by sub-dividing beats into two, three and four. I’ll also demonstrate bass groovesthat use each of these sub-divisions. If you want to improve your bass groove, try thinking more about subdivisions. Rhythmic subdivisions exist within all music. They’re created by dividing beats into smaller sub-beats. Subdivisions on bass are the key to having great timing. Rhythms are created by playing notes on subdivisions. 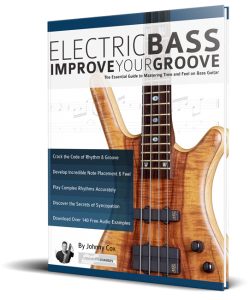 If you want your rhythms to be accurate and your bass lines to groove, then you must place your notes accurately onto them. There aren’t as many different subdivisions as you might think. In theory you could divide a beat into any number. However, most music divides beats into either two, three or four. If you can execute these three subdivisions accurately then you will have a great groove in virtually all musical situations. The first example features an eighth note subdivision, meaning each beat is subdivided into two. If you’ve watched my other video lessons or read the book, then you’re already familiar with my system for counting beats and off-beats. I use the syllables Ta-Ka. Ta is the beat and Ka is the off-beat. Try playing the example above slowly while reciting Ta-Ka. Make sure the notes played on the beat land on Ta and the off-beat notes land on Ka. If you’re not sure how to do this, refer to the video where I demonstrate this at 1m53s. Have a look at this example. It’s a groove with the beat divided into three. The added off-beat subdivisions that you get when you subdivide a beat into three and four mean that there are so many potential variations of rhythm. It would be impossible to even give an overview in just a single lesson. So please check out my book for many more examples. It may seem odd that this sixteenth note example feels less busy than the previous example. You might assume that more subdivisions mean more notes, but that isn’t necessarily true. The example above is a sixteenth note rhythm because there are three notes that can only be played if you divide the beats into four. Therefore, you must feel the sixteenth note subdivision all the way through the example in order to really groove. The most important thing to remember about subdivisions is that you must always feel the smallest subdivisions on bass all the way through any piece of music you play. Sometimes that will mean dividing the beats into two (eighth notes) and sometimes into three (triplets) and four (sixteenth notes). Remember, if you want to improve your bass groove, you need to think more about subdivisions.